Mahabharata story: Krishna, Arjuna, the widow and her cow! 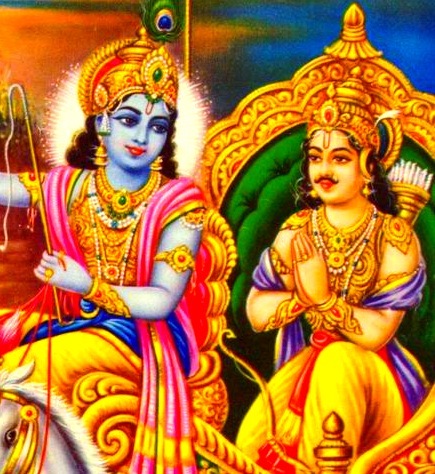 Sri Krishna and Arjuna once were guests of a widow. The widow had no children, nobody. She was all alone. But she had a cow. This cow was her only means of support. She used to sell milk, and by selling milk she used to maintain her life. In same time she was a great devotee of Sri Krishna. When Sri Krishna and Arjuna went to visit her in disguise, incognito, she was so happy to see these two divine guests. She fed them with whatever she had in her house. Sri Krishna was extremely pleased with her surrendering attitude and her devotion. On their way back, Arjuna said to Krishna, You were so pleased with her. Why didn’t you grant her a boon? Why didn’t you tell her that she would be prosperous soon, now that you are pleased with her? I have already granted her the boon that her cow must die tomorrow. – spoke Krishna. What? Her only means of support? She has only the cow, and nothing else. Without the cow how can she live on earth? Krishna answered, You don’t understand me Arjuna. She always thinks of the cow. The cow has to be fed, has to milked, has to be bathed and so forth. I want her only to think of me, and when the cow is gone, she will think of me all the time, twenty-four hours. Then soon the time will be right for me to take her away from this world, and after a few years I will give her a better and more fulfilling incarnation. to me. Otherwise, this way she will linger on earth and constantly think of the cow and not of me. and sufferings but we do not understand his hidden plans. The word su-samīkṣamāṇa indicates that a devotee earnestly awaits the mercy of the Supreme Lord even while suffering the painful effects of previous sinful activities. Lord Kṛṣṇa explains in the Bhagavad-gītā that a devotee who fully surrenders unto Him is no longer liable to suffer the reactions of his previous karma. However, because in his mind a devotee may still maintain the remnants of his previous sinful mentality, the Lord removes the last vestiges of the enjoying spirit by giving His devotee punishments that may sometimes resemble sinful reactions. The purpose of the entire creation of God is to rectify the living entity’s tendency to enjoy without the Lord, and therefore the particular punishment given for a sinful activity is specifically designed to curtail the mentality that produced the activity. Although a devotee has surrendered to the Lord’s devotional service, until he is completely perfect in Kṛṣṇa consciousness he may maintain a slight inclination to enjoy the false happiness of this world. The Lord therefore creates a particular situation to eradicate this remaining enjoying spirit. This unhappiness suffered by a sincere devotee is not technically a karmic reaction; it is rather the Lord’s special mercy for inducing His devotee to completely let go of the material world and return home, back to Godhead. A sincere devotee earnestly desires to go back to the Lord’s abode. Therefore he willingly accepts the Lord’s merciful punishment and continues offering respects and obeisances to the Lord with his heart, words and body. Such a bona fide servant of the Lord, considering all hardship a small price to pay for gaining the personal association of the Lord, certainly becomes a legitimate son of God, as indicated here by the words dāya-bhāk. Just as one cannot approach the sun without becoming fire, one cannot approach the supreme pure, Lord Kṛṣṇa, without undergoing a rigid purificatory process, which may appear like suffering but which is in fact a curative treatment administered by the personal hand of the Lord.